Aoyama, Yuko and Michael B. Teitz, 1996. 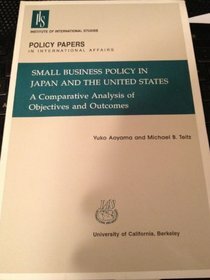 Small Business Policy in Japan and the United States: A Comparative Analysis on Objectives and Outcomes. Policy Papers in International Affairs 44 Institute of International Studies, University of California at Berkeley.